Joint investigations by the BBC and BuzzFeed News have provided two major scoops in the past 12 months, but this is not part of any broader partnership, the two parties have told PRWeek. Yesterday (Monday), allegations of widespread match fixing in elite men's tennis following a joint investigation by BuzzFeed News and the BBC garnered international headlines. The Huffington Post UK yesterday referred to the two organisations as "curious bedfellows". 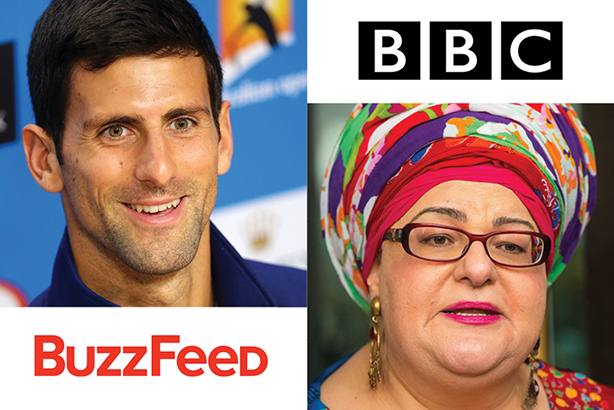 In July 2015, joint investigation by BBC flagship current affairs programme Newsnight and BuzzFeed News revealed that the Government was withholding funding from the charity Kids Company unless chief executive Camila Batmanghelidjh stepped down. Further allegations of financial and other irregularities followed, and then the demise and subsequent liquidation of the charity. A spokesman for the BBC said: "There isn’t a wider formal partnership with BuzzFeed. We are happy to collaborate on investigations with other news organisations where appropriate." On the tennis story, the BBC spokesman said: "Simon Cox had been looking into match fixing in tennis for some time. He became aware that BuzzFeed was also looking into this and decided to collaborate with it, as both teams had uncovered different parts to the story." A BuzzFeed spokesman sent PRWeek a statement saying: "For this investigation, as with the partnership between Newsnight and BuzzFeed over Kids Company, it made sense for BuzzFeed News and the BBC to collaborate, with both parties providing significant journalistic expertise. "We are open to working with the BBC and other media outlets on the right investigations." Both sides said they asked for this story, and the Kids Company revelations, to be credited as a joint investigation. BuzzFeed has been keen to have 'News' included in its name as it looks to build its brand as a serious journalistic organisation in addition to the listicle, cat picture and clickbait fare for which it is better known.